Superior quality - weight and texture. Luxuriate in the cozy comfort of this ultra-soft, German flannel duvet cover set. Crafted from thick 100% cotton yarns with a unique construction specifically developed to achieve the softest, thickest flannel available, these duvet covers and matching shams are heavyweight, long-lasting and resistant to color change and pilling. Awarded the strict MADE IN GREEN by OEKO-TEX ®certificate ensures these duvets are both safe, and environmentally and socially responsible. 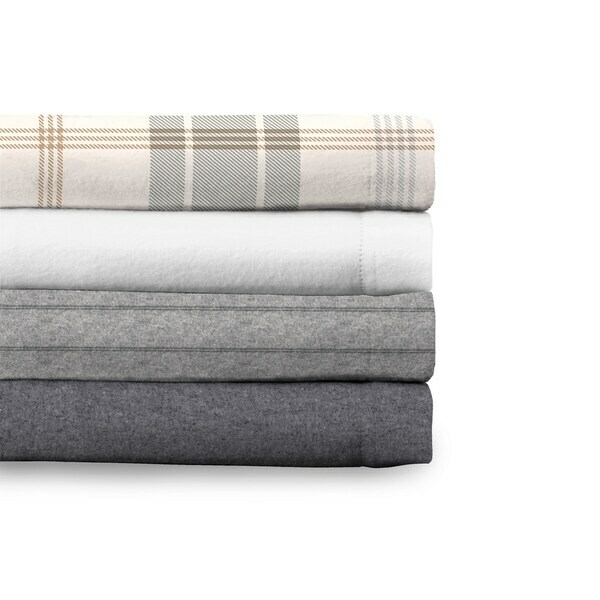 The German flannel sets are available in solid white, gray heather, yarn dyed gray heather double pinstripe, and sophisticated gray/ivory plaid design. This highly comfortable duvet cover set is sure to keep you or a loved one warm on those cold nights thanks to the 6-ounce flannel material. In addition to flannel's natural tendency to provide warmth, this two or three-piece duvet cover set is gently napped for added body heat retention. This duvet cover set is also made to withstand long usage and washing with it being closely loom woven to maintain its original form. I decided to buy flannel sheets when I realized how much more comfortable it is to get into bed on a cold winter night when your sheets don't conduct the cold. While it's easy to find flannel sheets, finding a flannel duvet set is tough. This set is AWESOME and contains two standard shams and one duvet cover. The duvet cover has button closure along one side that is cleverly designed so the button surfaces are on the INSIDE - you can't feel them or see them. There are corner ties inside the cover meant, I believe, to keep your comforter in place; I don't use/need them so I tuck them away. The shams are generously sized and have an envelope fold closure that holds your pillow securely in place. The flannel is exactly as described, both very soft and heavyweight. It is a little lint-y at first washing/use, but perfect thereafter. I've had the set for about a month and can say that it washes well, remains soft, does not felt, and retains its color. The color of the natural/cream is more yellow than it appears, but I've gotten used to it. You will enjoy a toasty, comfortable night's sleep under this duvet. Definitely buy it. The price is phenomenal for the quality (beautifully sewn seams and buttons, heavy luxurious fabric), and Overstock shipping and customer service is excellent. Enjoy. I ordered the Duvet cover for our master bedroom, as I have a down comforter that leaks feathers. I ordered the Euro flannel sheet set last month which we love. So I fiqured this would go with it. It is durable (I have washed it several times) and it looks better than new when it goes back on the bed. You can really tell the quality of the fabric with this. It is wrinkle resistant and heavy weight. I am more than pleased with it. I purchased this duvet cover in size full, color Morocan Blue. As recommended by others on this site, I washed it before using it in cold water on a delicate cycle, with 1 cup of white vinegar. This item pilled a decent amount in the dryer (had to clean the lint trap 2 or 3 times while drying) but it came out of the dryer in excellent condition, and even softer than when it went in. The construction on this duvet cover is excellent, you can tell it is very well made and will last. The duvet cover has 2 tie downs, and buttons along the side. I have not had any issue with the comforter bunching up or shifting around inside. I paired this duvet cover with a comforter purchased from Overstock, Item#13831625 and it has been a great combination. This duvet and that comforter are the same dimensions, so they fit absolutely perfectly. Even in the extremely cold temperatures we've been having, this duvet cover and comforter have kept me extremely warm without having to turn on the heat at night. This Duvet Cover Set is very warm and comfortable. Highly recommend! For a good price, this item (duvet plus two shams) is adequate, pleasant, but not great. What's not great is the quality of the flannel, which is perhaps only one step above cheaper items available at WalMart or elsewhere. So we think this is adequate for the purpose, and perhaps the price, but don't get your hopes up that with German engineering, this is classically beautiful, or thick fabric, or luxe. It isn't. Just OK by our standards, running a lodging operation here in Telluride, CO. 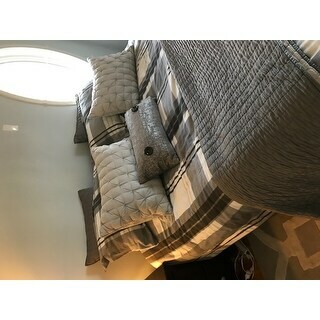 This luxury German flannel ultra soft/heavyweight duvet cover & pillow shams were just that: soft, heavy & of high quality. I have a couple terrors ...sorry ...terriers, that like to lounge during the day seeking out sunbeams on the bed & this duvet cover allows me to extend the life of my comforter. I recommend this set. I bought these flannel duvet covers for each bed and would not trade them for anything. They are soft but very warm and they keep their shape after machine washing. The inside ties keep the comforter from shifting like some other duvet covers. I liked the quality so much that I ordered pillowcases to match the duvet cover and shams. I would definitely order these again. We love our new flannel duvet set. I've only washed it once, so can't really comment on how the flannel will endure, but so far we are very pleased. The flannel is thick! I love that the duvet has corner ties, our last one did not. The shams are beautiful. I looked a long time for a new duvet, and should have gone to Overstock to begin with. You cannot beat this price, either! We had been shopping for a replacement duvet cover for a while, all that I kept finding overpriced stuff from China. I was very pleased to find this one, very good spec's and made in Germany. It arrived a day earlier than expected and was even better than I had hoped for. This cover lives up to its Overstock description; very soft & heavy flannel, sized exactly as described. It has extra long ties on each of the inside corners to hold it to the comforter's corner loops. We have used this duvet cover for over a month now, it continues to be soft & warm. I haven't washed it yet, based on washing the pillow covers (part of the set) it should wash very well. We would buy another one of these in a hearbeat. Not only was this product great because it was so soft and warm but it fit my mattress great. I have a Dormia mattress that is deeper than most other mattresses. I had a hard time finding sheets that would fit and stay around my mattress but these do the trick with a little to spare if i wanted to get an extra pad. If you've had this same problem than this product is for you! This duvet is a welcome addition to our bedroom - it is thick and oooh-so-soft. Very nice...! I bought this item a few months ago. When it arrived, I was overjoyed. It was soft and cozy, and made our bed feel really warm and inviting. My husband said that it was the softest duvet cover we've ever had. I ordered a queen, for our queen comforter, but it was significantly larger and had a lot of extra fabric. The issue is fixed (somewhat) by the ties on the inside, which hold the corners of the comforter in place, but that's not the reason for my negative review. Within two weeks, the fabric of the duvet cover pilled up into tiny white balls which converted our otherwise clean bedroom, into a snowy landscape. These little white balls have stuck to every other fabric surface - our pj's, our carpet, and even to the curtains. I returned the item (thanks to overstock's great return policy) and got a new one. Within two weeks - same problem. I am now returning the second one and will not be buying this product again. You shouldn't either. Nice heavy weight, soft, high quality flannel. I followed the instructions of another customer to prewash the sheets in vinegar instead of detergent in the washer and clean out lint trap every 10 minutes during dry cycle. No evidence if pilling or shedding so far. Love them! I washed and dried before use, according to the manufacture instructions. The cover shrunk so much, it was unusable. Overstock, as always, provided great customer care and the item was returned. got this to match sheets. expensive but worth it. These sheets are warm and cozy. The addition of rayon gives a lighter weight without detracting from comfort on deep winter nights. I love this comforter. It is extremely soft. It fits my king comforter perfectly. I like the ties that hold the inside comforter in place. The gray and white colors match my sheets and pillows so the colors in the pictures are true. The pillow shams are good sized and it all makes my whole Master bedroom look great. This looks awesome on my bed. I was looking for something soft, white, and made of flannel and these are perfect. Makes it hard to get out of bed in the morning! So amazingly soft and warm. Could not love it more. This is so soft and well-made, I can hardly wait to crawl under the covers! Very nice, but didn't end up working for us. Good quality though and well made. I would definitely recommend this duvet set to a friend. I read a review prior to buying them that one me over. The only thing that I might change is the color selection. The fabric is soft and of a high quality.